Today, the fifth day of the Chinese New Year, is the day to welcome God of Wealth. Traditionally, early in the day one will heard drums and gongs, fire crackers from the shops as well as a fest of food to invite the God of Wealth for visit, some might even go through the trouble of welcoming him early in the night so to make sure he will not be going anywhere else. On this new year print there are 2 Gods of Wealth, one academic and one martial. The god of wealth is a title, it is not attributed to a single saint but a handful of saints. 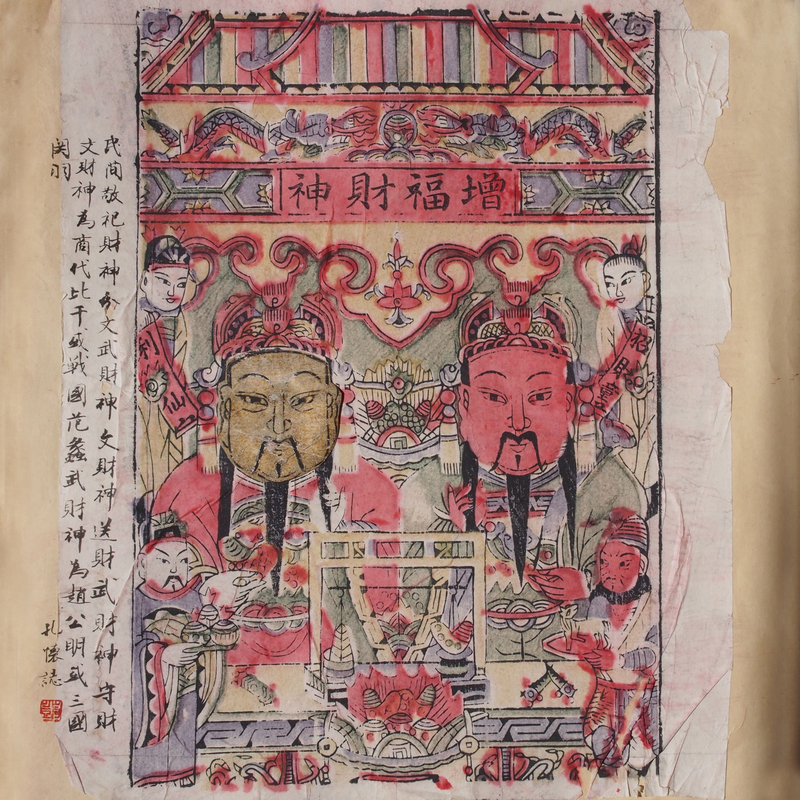 The Academic God of Wealth has the task of delivering wealth and commonly refers to Fan Li and Bi Gan, both a loyal and wealth character who helps out with country and the poor. The Martial God of Wealth is responsible for safe guarding the wealth, they are General Zhao Gong Ming and General Guan Yu, both legendary fighters. See our other God of Wealth.